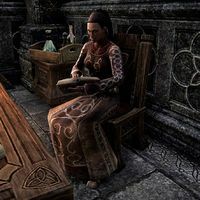 Sharyaddan is a Redguard alchemist who can be found in the Chironasium in Wayrest. She's upstairs in the western office reading her tome. She can teach you a little about alchemy. If spoken to, she says, "I love having an isolated, quiet place for our studies, but I must admit, some of the alchemists and enchanters working here tend to be a bit... melodramatic. That's often the result of seclusion and scholarly pursuits." This page was last modified on 1 September 2018, at 07:31.